3D Skeleton Carnival is a dark and charming 3D Halloween treat. 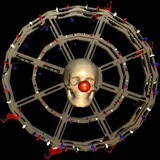 3D Skeleton Carnival 1.0 is screen savers: other software developed by San Diego Screen Savers. 3D Skeleton Carnival is a dark and charming 3D Halloween treat. Skeleton Carnival has stylized animations of skeletons performing or playing in a Carnival atmosphere set against a solid background. Skeletons juggle, ride a carousel or swing from a crows cage. Ferris Wheels have clown skeleton center piece. User can tint skeletons and change background color. Slow slide show type background music is perfect for these active skeletons. This program is shareware, which means you can download and use 3D Skeleton Carnival 1.0 for free during 30-days trial period. After this period you gonna have to buy 3D Skeleton Carnival 1.0 software for $10.00 or uninstall the program. 3D Skeleton Carnival 1.0 supports different languages (including English). It works with Windows 98/XP/Vista. We have tested 3D Skeleton Carnival 1.0 for spyware and adware modules. The software is absolutely safe to install. We has completely tested screen savers: other software 3D Skeleton Carnival 1.0 many times, written and published the interesting article and uploaded installation file (5796K) to our fast server. Downloading 3D Skeleton Carnival 1.0 will take minute if you use fast ADSL connection.